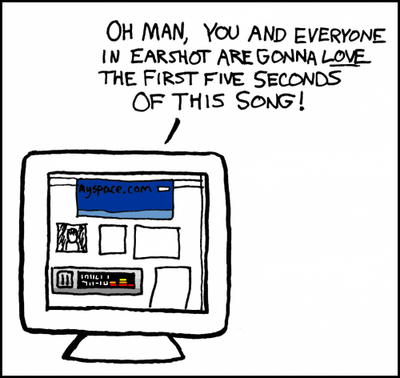 This post was inspired, again, by Randall Munroe’s great, geeky, cartoon XKCD. If you’re old enough to remember the days before twitter and facebook the you would remember things mentioned in this post. This was the 90s web. Going back to the days of Web 1.0. The classic web. The web that told you things. Today it’s the medium to ask. Get your message out quickly. You don’t need to find the correct forum for your favourite show. Be that Babylon 5 or Star Trek. If you couldn’t find one then you could get some free web space at Geocities. I’m still scared from some of those sites. Horrid, twinkly, background gifs and everything in Times New Roman as the FONT tag hadn’t been invented. Not only that, it seemed that 30% of the web was still “under construction”. Using a gif of a man digging or something equally as dreadful. We had the HR tag but nobody used it as it was just a bit boring. We used the CENTER tag and a gif of barbed wire or sometimes a bomb and a fuse. “acid green” was used as the transparency colour as no piece of the wanted gif was going to have this colour in it! We didn’t have CSS but we had flash instead. Search engines were altavista, yahoo or webcrawler. The had over 25 million pages indexed! That was, probably, most of the known web at the time. The most heinous crime that this stage of the web gave us was auto-playing MIDI files. These started to play when the page load was complete. A couple of seconds after it finished. This was the days of dial-up at home. It was a wait for the page to actually load and we didn’t want that extra time and cost to download your sh***y MIDI file that we couldn’t stop! I can’t remember what tag was required. It could have been AUDIO but then again it’s a tag I never used. Not because I thought it was hideous, more that I couldn’t find a MIDI file I liked.